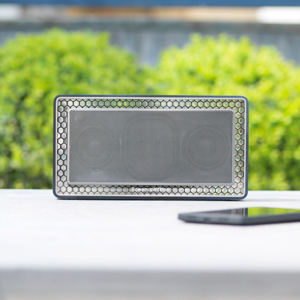 PORTABLE HI-FI AUDIO – T7 is a hifi speaker you can pick up and play anywhere. Just charge it up, and it’s good for 18 solid hours of playback. Take your premium audio with you. HI-RES BLUETOOTH TRANSFER – With T7, you can stream audio directly from any Bluetooth-enabled PC, tablet, or mobile phone. T7 uses Bluetooth aptX, which allows the transfer of high-res audio data to produce exceptional sound quality, wirelessly. 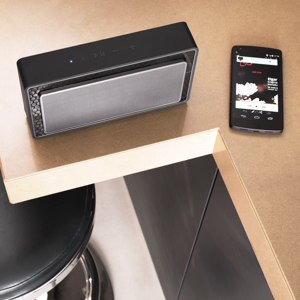 TWIN BASS RADIATORS – Designed for the optimum balance of movement and stiffness, the T7’s twin bass radiators deliver beats and bass lines with serious depth and impact, unrivaled by any other bluetooth speaker. Power supply voltage: 100-240Vac, 50/60Hz,1.0 Amps(power supply),output: 15Vdc, 2.0 Amps. 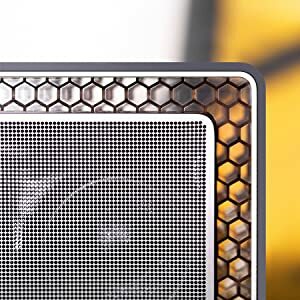 REDUCED VIBRATION AND DISTORTION – T7’s rock-solid stability is thanks to Micro Matrix: a rigid honeycomb of interlocking cells that brace the cabinet and reduce vibration and distortion. Bowers & Wilkins products consistently set the benchmark for high-performance Hi-Fi, home cinema and personal sound. 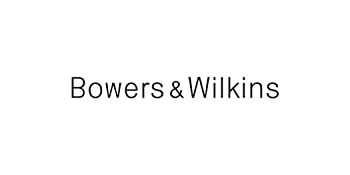 Bowers & Wilkins manufactures loudspeakers, headphones and Wireless Music Systems, and is also the audio system of choice for the legendary Abbey Road Studios in London and premium automotive manufacturers. 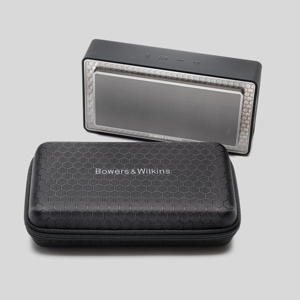 T7 Wireless is Bowers & Wilkins’ only portable wireless system, allowing you to have fantastic sound. T7 Wireless raises the bar for audio performance from a wireless speaker. Using our 50 years of expertise, we’ve created a sound experience that will inject new life into any social situation. When fully charged, T7 Wireless delivers an incredible 18 hours of playback. More than enough time for a picnic in the park, or an evening round the barbeque. Thanks to Bluetooth aptX technology, you can stream your music in wireless high-resolution quality. Using T7 Wireless is easy. With few buttons, light signals and audio cues convey basic functions intuitively. No fiddling – just music. This stylish case is the perfect accessory for T7 Wireless. 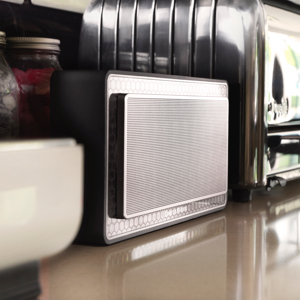 Fitting the speaker perfectly, it’s ideal for keeping T7 safe from scratches and knocks on your travels. Sold separately. Powerful, crystal-clear audio in the palm of your hand. It takes a lot of acoustic know-how to deliver great sound from a small system. And we’ve used every technological trick we know to make sure that T7 Wireless packs an amazing sonic punch for such a little speaker. 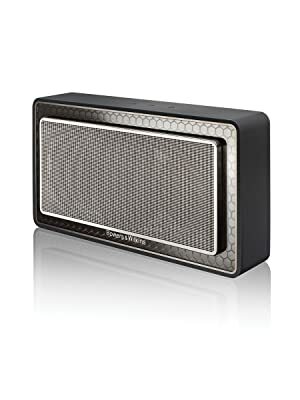 The Bowers & Wilkins T7 portable bluetooth speaker combines high-quality Bluetooth aptX wireless streaming with compact size, and rechargeable convenience for fantastic listening anywhere you are. 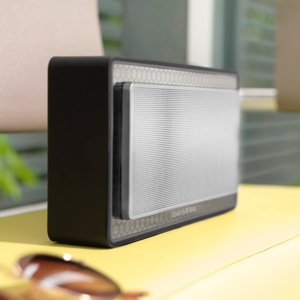 With 18 hours from a single charge, T7 Wireless speaker is the perfect choice for festivals, barbecues, and picnics. Compact speaker, serious sound. Twin bass radiators deliver dynamic audio with serious depth and impact. Innovative design means T7 Wireless packs in two 50mm drive units, so high-performance sound can travel with you. Advanced audio convertors and high-quality digital processing means T7 Wireless sounds pristine, even at high volumes.